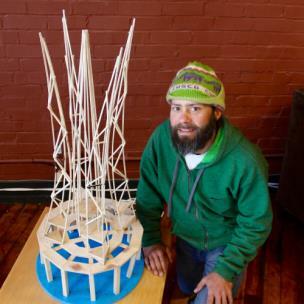 It's a day of free family fun on the Southside April 27 when Sculpture Fields celebrates its Spring into Sculpture event, which culminates with the sculpture burn of a 3-story wooden structure by artist Andrew Nigh. His creation will be set ablaze. The day will include a laser light show, live music, artists creating their paintings and drawings outdoors, picnicking from food trucks and a beer and wine tent and other interactive activities. Sculpture Fields is at 1800 Polk St., which turns off of E. Main Street. Artist Andrew Nigh has been designing and creating his pyro kinetic outdoor sculptures for more than 15 years. Each sculpture is designed to inspire emotional interaction with the viewer. 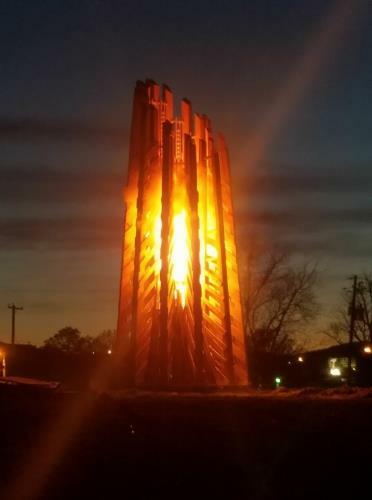 “Continuum” will be a 3-story fire sculpture that consists of a base pediment upon which four, vertical ellipses rise to surround a central core. The piece will begin its dissolution from the top down illuminating the core with brilliant flashes of magnesium before igniting the surrounding staves and finally the base structure. As the supports become compromised by the flames the structure should collapse in a downward, rotating fashion.